Start with a deep brushing, carefully working out any mats and tangles. A matted coat will cause skin problems, irritation and discomfort. A badly matted dog should be seen by a qualified groomer with the tools and training to address the problem humanely. Check for parasites. While you are brushing and combing, inspect the dog’s skin for signs of fleas, ticks and other parasites. Don’t stop parasite prevention treatments yet; those pests will be looking for a ride indoors before the cold weather arrives. Shampoo thoroughly to remove dust, dirt, mold spores and parasites. Follow with a conditioner to moisturize sun-damaged skin. Towel dry, then brush and comb the coat. It’s best not to use a home hair dryer, because it can burn the dog’s skin. Do an ear check for problems that may be triggered by summer swims. If the ears have an odor or show signs of redness, or if the pet is scratching at them, proper cleaning by a professional groomer or veterinarian is in order. Obesity is a growing major epidemic. (You’ve heard this before? Read on.) Obesity is affecting every age and every location. (“OK,” you may say. Keep reading.) Obesity can lead to life-altering and -threatening chronic diseases such as diabetes, heart disease, bone and joint problems and hair coat problems. (“Yes, yes…er, what?”) Obesity leads to early death and rising healthcare costs. (You ask: “Certainly, but what do you mean by ‘hair coat problems?’”). Obesity is affecting nearly every population, every group, ranging from beagles to poodles to Labradors to Siamese to British Shorthairs to Terrapins. (“Wait, are we talking about people?”) Yes, there is a global human obesity epidemic, but there is also a growing pet obesity epidemic. According to the Association for Pet Obesity Prevention, in the United States, an estimated 52.7% of dogs and 57.9% of cats are overweight or obese. (Yes, a lot of fat cats.) This translates to the following estimates: 43.8 million overweight or obese dogs, 13.9 million obese dogs, 55 million overweight or obese cats, and 26.2 million obese cats. (Yes, this is the unfortunate truth about cats and dogs.) Common consequences of obesity for cats and dogs include heat intolerance, decreased stamina, reproductive problems, osteoarthritis, diabetes, high blood pressure, heart disease, breathing problems, ligament injuries, kidney disease, many types of cancer and decreased life expectancy (up to 2.5 years). Even though less data is available, anecdotal evidence suggests that obesity is a growing problem with other pet species such as birds and turtles. What is happening and what are we doing to our pets? In some ways, the pet obesity epidemic lends insight to the human obesity epidemic. You can’t blame plus size pet models, the pets for being lazy, or other things that people to tend to incorrectly blame people for with regard to obesity. As with the human obesity epidemic, the social, environmental, cultural and economic systems around pets are changing. For example, pet diets are changing with more calorie-dense and processed foods…just like human diets. Pets may not be moving around as much because their owners are becoming increasingly sedentary. (Could pet obesity be a sign or harbinger for human owner obesity?) And who knows what the effects of different medications such as antibiotics are having on pets. Weigh and keep track of your pet: The problem is that you may not be able to tell if your pet is obese. There are no Madamefelines fashion magazines, Puppy’s Secret fashion shows, or Pets in the City television shows that set potentially arbitrary standards for how pets should appear and act. Except for Garfield perhaps, and he appears quite obese and shows that heavier pets may even appear “cuter” to owners. As with people, obesity is not purely an appearance issue for pets. Real scientific measurements such as the body condition score (BCS) are what matters. There may be some physical clues that your pet is overweight such as you can’t feel your pet’s ribs or see your pet’s waist. The Pet Food Manufacturers’ Association (PFMA) developed a set of Pet Size-O-Meters to help roughly evaluate your dog, cat, rabbit, bird or guinea pig. Take your pet to the vet: Unless you know the ideal body weight and BCS specific for your pet’s species, breed and age (e.g., a hamster should not be as heavy as a sheepdog), a veterinarian will know better what numbers are in the healthy range. The veterinarian can also perform a physical exam and other relevant tests. When you have pets, you have to be careful with furniture. Your sofa or armchair can easily turn into a giant scratching post, chew toy, or hair magnet. And the upholstery fabric you choose can make a big difference. 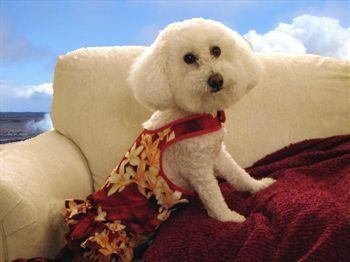 I am Zoe, My mom went to Hawaii and all I got was this dress!!! Consider Synthetic Fiber (Ultrasuede/Microfiber): It’s not always easy to get excited about this choice aesthetically (that said, there are always exceptions, especially if the shape of the sofa or chair is super stylish), but it’s about as close to “pet proof” as you can get. Cats don’t seem to like scratching it (especially if there is a scratching post nearby) and even if they try, it’s easy to brush away, if it even shows up. Cleaning is easy too, especially if the upholstery code is “W”: you can use a simple solution of soap and water. Lots to Love with Leather: The allure of leather is that it is mostly resistant to odor and it doesn’t attract pet hair. If by chance some actually happens to find its way onto the cushions, it wipes off easily with a dust cloth. Cats seem to avoid leather as long as there is a scratching post nearby, and if your dog leaves a scratch you can usually buff it out. If it’s an option, choose distressed leather, it will draw less attention to scratches and scuffs. Embrace Outdoor Fabric: Widely available and intended for (surprise) use outdoors, this fabric is extremely easy to clean and can be found in beautiful colors and prints and natural materials. While it might not always be as soft as the synthetic fibers mentioned above, it’s got more going for it in the way of patterns and prints. If your pet has found a favorite chair or spot on a specific sofa, it might be worth the effort to get a slipcovers made out of this fabric. They suggest staying away from tweed, which can trap the hair in its weave. Of course, pets and their habits vary, so your mileage will, too. But each of their suggestions have some valid points to consider. Check out the full post for yourself here. Regular pet grooming is just as important for dogs as it is for humans. A proper grooming routine keeps dogs clean, happy, and healthy. Moreover, regular grooming can prevent a variety of diseases and infections caused by matted hair, wax build-up, bacteria, dirt, and a variety of other contaminants. Preventative measures such as these can also curtail unnecessary canine health issues and potentially expensive trips to the vet. Here are some essential tips on pet grooming for dogs and ways to avoid potentially expensive as well as unnecessary veterinary bills. Gizmo, PD and Jelly Bean (L to R) – Jelly Bean says that she is so happy that her MOM found Hound’z Of Hollywood and is taking such good care of her family and don’t we look fabulous!!! 1. 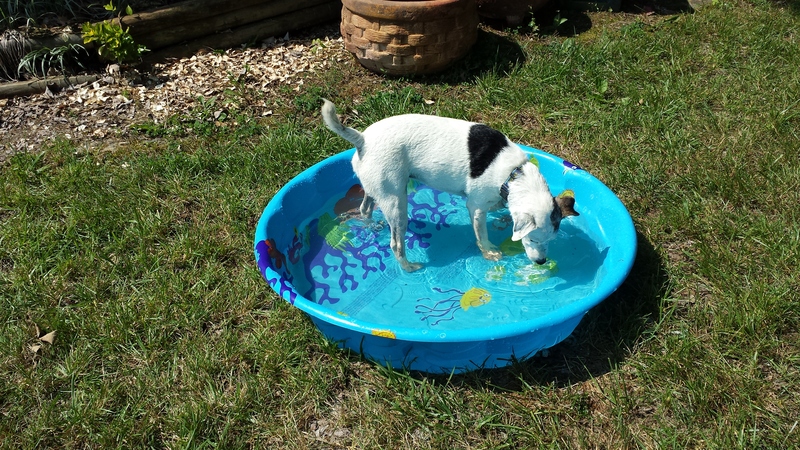 Bathing–It is generally recommended that most dogs get a bath every 2-4 months. However, if the animal gets into something foul or sticky, the dog should be bathed immediately. It is also important to note that bathing an animal too frequently will dry out its skin and strip its coat of natural oils. Moreover, certain dog breeds require more frequent bathing needs. It is best to do one’s research ahead of time so that owners are prepared to care for their canine friend, especially if someone is a first-time owner. 2. Brushing–Establishing a regular brushing routine with a canine is a terrific way to bond with the animal. Moreover, it removes dead/dry skin and hair, re-distributes the oils for a clean and healthy coat, stimulates the skin’s surface, and helps the owner become familiar with the dog’s body. Furthermore, it reduces matted hair, dirt and bacteria build-up, as well as skin irritation for canines. Not to mention, regular brushing just makes dogs happy. It is recommended that owners should brush their dogs every couple of days, regardless of the length of their coat. 3. Nail Care–Another essential tip for pet grooming involves allowing dogs to become familiar with having their feet touched prior to attempting nail care. Some animals can get very upset at this unsettling and foreign feeling. Begin by rubbing a hand up and down their legs, and then, gently press each individual toe on each foot. Be sure to give dogs lots of praise, attention, and some treats while doing this preparation so they view it as a rewarding experience. Dogs are different, but chances are that within a week or two of daily foot massages, the canine will be better able to tolerate a nail trim. When trimming a dog’s nails, begin by spreading each of their feet to inspect for dirt and debris. Make sure to use sharp, sturdy nail clippers to cut off the tip of each nail at a slight angle. Owners should cut just before the point where the nail begins to curve. Extra care must be taken to avoid the nail quick, which is a vein that runs into the nail bed. The nail quick is usually pink and can often be seen through the nail. However, dogs with black nails require extra care and attention, since the quick will not be as easily discernible. If the nail quick is cut while trimming, it may result in bleeding and some styptic powder can be applied to stop the bleeding. After the nails are trimmed, use an emery board to file and smooth any rough spots. 4. Dental Care–Just like humans, dogs can suffer from a variety of dental issues (e.g. gum disease, tartar build-up, cavities, etc.). It is also important to note that bacteria from gum disease can enter a dog’s bloodstream causing many other health problems. Making a canine’s dental care a priority will spare the animal unnecessary pain and health concerns, as well as their owners significant vet bills. It is recommended that owners should clean their dog’s teeth 2-3 times per week. 5. Special Breeds With Special Needs–Dogs with loose facial skin or wrinkles, such as pugs or shar peis, will require special grooming needs. The skin folds should be cleaned via damp cotton to prevent bacteria growth and dirt from causing irritation as well as possible infection. Moreover, it is also important to always thoroughly dry between the skin folds. For dogs who have droopy or long ears, their owners should check them weekly. Dirt and wax should be removed from the canine’s ears with a cotton ball moistened with water or some mineral oil. Some breeds may also require excess hair removal from areas such as their face or ear canal. Owners should consult a dog groomer or vet for excess hair removal tips and/or procedures before trying it at home. There are special hair removers available on the market that allow hair to be removed one strand at a time. Dogs that suffer from skin and/or certain medical conditions may also have special pet grooming requirements. It is best for owners to their research and consult a vet or pet groomer for special handling tips so that they are prepared to care for their animals. Just like humans, dogs require a regular grooming routine. A proper grooming routine keeps pets clean, happy, and healthy. Moreover, regular grooming can prevent a variety of diseases and infections caused by matted hair, wax build-up, bacteria, dirt, and a variety of other contaminants. Preventative measures such as these can also curtail unnecessary canine health issues and potentially expensive trips to the vet. Hopefully, these essential tips on pet grooming for dogs will help owners avoid potentially expensive and unnecessary veterinary bills, as well as spare canines unnecessary health issues and distress. Pet grooming is often perceived as being purely for beauty, but in reality it’s hugely important for their health and well-being – even if you’re not planning to enter them in Crufts. How often you groom your pet will depend on a number of factors (such as the length of their coat) but it’s an important part of every pet’s routine. Grooming can help you spot fleas, bumps and cuts as well as skin problems – and will also help you bond with your pet. 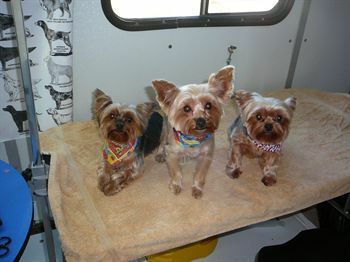 You should try to get your pet accustomed to grooming while they are still a puppy or kitten. If you wait too long to begin grooming, your pet may find it harder to get used to – especially when it comes to things such as nail clipping. Talk to your groomer about when to start grooming your pet. Hi I am Zoe, this was my first time using Houndz Of Hollywood and wasn’t Charlie GRRRREAT!!! If your pet is particularly energetic, you might find it hard to keep them still for long enough to thoroughly groom them. Don’t get disheartened though. Start simply, by taking a small section of their coat and groom them for little longer each time with lots of praise afterwards. With plenty of patience, your pet can actually enjoy being groomed and it can also improve the bond between you and your pet. You should try to brush your dog a few times a week, or slightly less for dogs with short hair. Use a specialist brush or comb and groom small sections of hair at a time. Holding your hand close to your dog’s skin will reduce any tugging and make it easier to see any dirt, abnormalities or fleas (little black specks can indicate your pet has fleas). 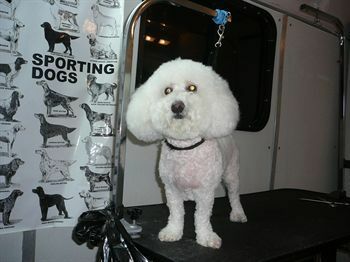 Consult your groomer for advice on the best way for you to begin grooming your pet. When you come to groom your pet, you should also be checking for any abnormalities with their eyes and ears – regardless of whether you have a cat or dog. Tell your vet if you see any redness, irritation, or cloudy eyes as any of these symptoms could indicate an infection or a larger underlying problem. Active dogs may not need nail trimming, but it’s important to check regularly as long nails can curl and grow into your dog’s paws causing pain and infection – much like ingrowing toenails in humans. We suggest having a groomer or vet trim nails.